As a well-connected student at UBC (you’re welcome to disagree), I have become acquainted with a number of people over the years who I might refer to as ‘informers.’ Now in my 5th year of university, I get fairly frequent bits of insider information into the secret goings-on of this campus from these informers. Today is one of those days. This morning I was emailed by a guy I met last year at a beer garden. He’s seen my website before and told me he had something to post. He attached several photos and explained a little story, so I’ve decided to post the photos he sent me and paraphrase his email. 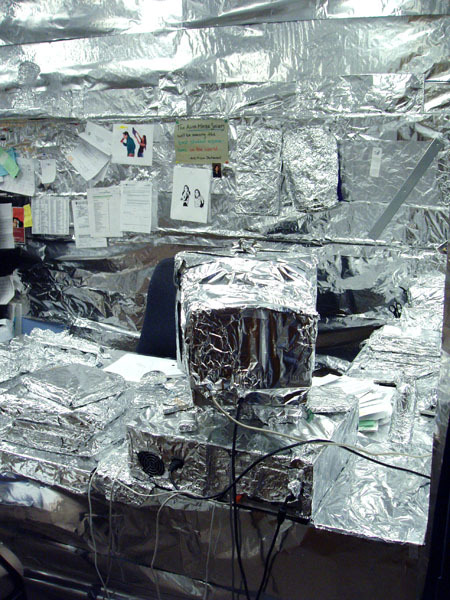 As you can see, there is a significant quantity of aluminum foil in the office. 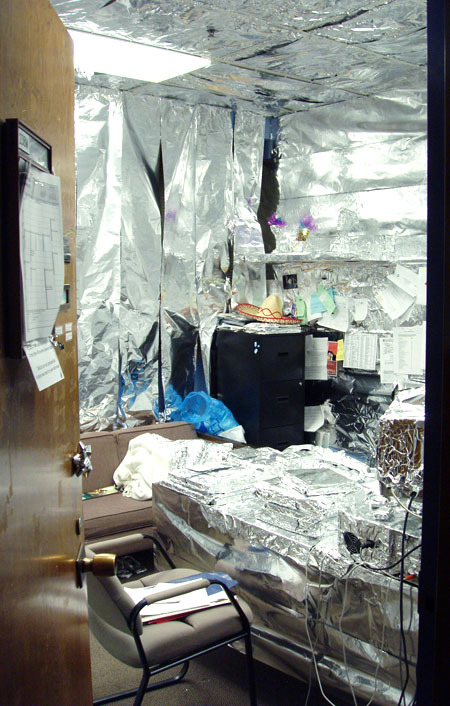 They covered the walls, the desk, the computer, the phone, individual books and even the thumbtacks on the bulletin board! Apparently, they also completely rotated the room, moving the desk, couch, chairs, fridge, and filing cabinet to new spots. They even did the ceiling – the VP Finance office now looks more like the VP Interior Design office. This note was left on the desk. It’s rather mysterious. Some of you may remember a castle appearing in AMS President Kevin Keystone’s office last February, with a large black hand painted on it (see here for the photos). Incidentally, it was the same informer who sent me those photos… coincidence? 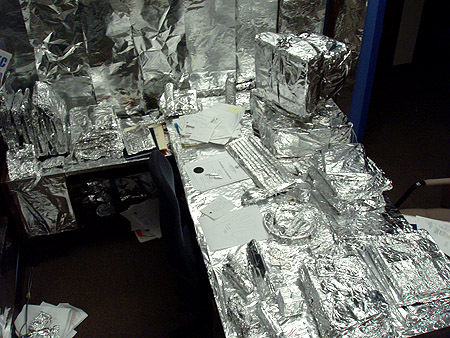 Note the plate in the upper right-hand corner with fork, knife, and spoon all individually foiled. My ‘informer’ told me there’s still old salsa and sour cream on the plate! I’m still trying to figure out what this ‘Black Hand’ is… having checked the AMS Clubs list, I’ve decided it’s not a club. Wikipedia has a listing for it, but it takes you to the UBC page which has no mention of the Black Hand. This leads me to believe that what I assume is some sort of organized group is trying hard to maintain its secrecy by removing all online references. Yet, having received these photos and permission to publish them, I wonder what their true intentions really are. 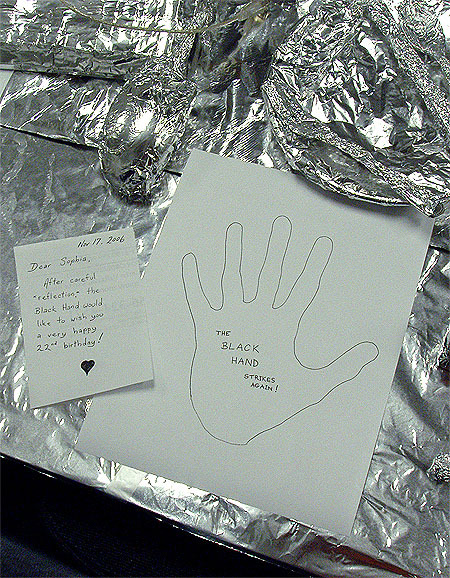 This entry was posted in Canada, Humour, North America and tagged AMS, Black Hand, Prank, UBC. and yeah about my post. i think it’s a never ending search. but who will stop even though they know it comes to nothing. i think way too much for my own good. heh. 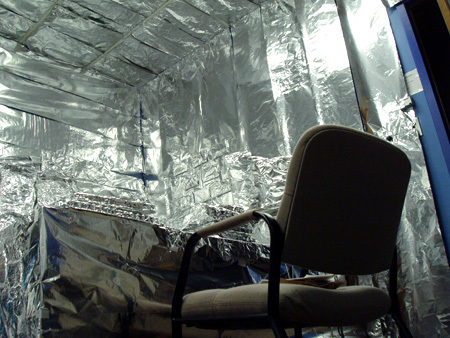 that room scares me, it looks radio active. i was watching tv the other day and there was a movie on. and something in there also mentioned a “The Black Hand” Syndicate..
you have a great informants. i wish someone would do this for my birthday.